Hydrated skin doesn't just look smoother and healthier-it's better able to function as a barrier against external aggressors. Dramatically Different Moisturizing Lotion and Gel are the moisture “drinks” developed by Clinique dermatologists to maintain skin’s optimal moisture balance. Work to soften, smooth, improve the condition and texture of your skin. Custom-fit to skin type in Very Dry/Dry Combination and Combination Oily/Oily skin formulas. I highly recommend this product for all skin types, it won't disappoint you. A little goes a long way every time! 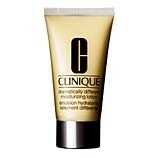 It's hydrating, illuminating and completely different to any moisturiser I've tried. It cannot be faulted; there are so many things this lotion does. My skin feels smooth, plump and sufficiently quenched of thirst, especially on my dry areas. The effect is long lasting and can with stand a busy day of work and study, so you know your skin won't be getting dehydrated or lose it's glimmer any time soon. There are really no faults with this lotion; the new formula is excellent. People often complain that price wise, this lotion isn't worth the money, but when you realise how long it lasts, you begin to understand it's actually pretty good for the money. Amazing lotion, I only need to use it once a day to see results and keep my skin looking full of life for longer. not dramatically different at all! Why is it called 'dramatically different'? It seems like every other moisturiser on the market for half the price. It's thin and quite watery in texture which means it doesn't feel nourishing or rich enough for my forty two year old skin, but perhaps that doesn't matter fir users in their twenties. However I just can't see why this moisturiser is rated so highly. a little bit on the expensive side, i wait until a duty free visit mostly to stock up! A little goes a long way, light and easily absorbed ready for whatever layers are going on top or indeed no extra layers at all. Evens out skin tones too. I have to say this is one of the best daily moisturisers I have ever used. Very light weight and absorbs really well, my skin after weeks of use s brighter, clearer and no longer dry. Redness is loads less noticeable and complexion looks really good. I am using the 3 step system and I have to admit it is the only one that does everything at once, clearing skin, hydrating and reducing redness. "I highly recommend this product for all skin types, it won't disappoint you."